The red dawn warned of discontent. Eyes danced around the silent Side Bar rooms as all monkeys waited in dreaded anticipation. Soon the vibration of heavy footed strangers accompanied the low hum of their rhythmic strides. Out of the mist the rabble was upon them. These weren’t your every day blokes these were the lowest of the low and us monkeys will forever hold them with contempt. This time the rabble of misfit brutes completely wiped out the banana rum but at least no monkeys were injured. As you can see, a rabble may represent a crowd of tumultuous people, a pack of animals, or a swarm of insects. On a different note, rabble could also represent a tool used to stir and mix in a roasting furnace. 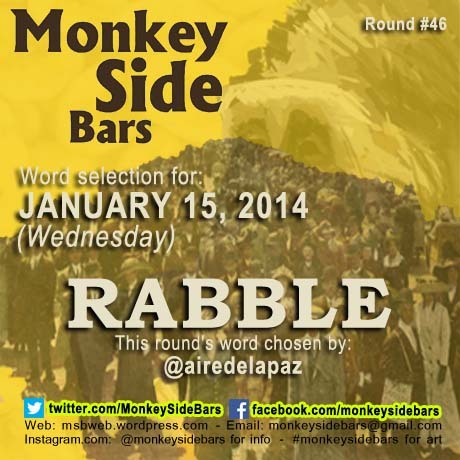 I’m truly excited to see all the monkey interpretations of rabble, Wednesday, January 15th!